Do you have a baby? Maybe you want to put baby picture on blog. Or you have baby clothes business? 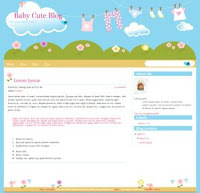 I thinks this template is suitable too, Baby Cute Blogger Template. No complicated setting requierement, you just need to set navigation bar. Baby Cute for Blogspot Template, all image is created as Vector Graphic. If you need SVG file, you can contact me. bisa di lempar sandal nich kalau cuman koment gitu doank..
itu khusus buat wanita yan g ke cewex cewex en to bong..
la nek untuk aku yang cool ini mana bong??? iku, hosting file gratisan.... gambar dan script. this one is really cute. I like it and gonna save it for my next blog project. mbak cebong itu caranya ngasihi kotak-kotak add this blog to your online bookmark site gmana caranya? Hua!!!!!!! aku pengen!!! Cantik banget, tapi kenapa ada celana situ?hihi. thanks dear for this template.keep on your creative superb idea. Hi! I love this theme and now it's in my blog, but i have a problem, i dont't like the number of post in the index and i need to know how change the number the html code, because whith the tool of blogger it dosen't works. @ regi:what do you mean? you mean like Label Template(5) like that? i am using this for my blog momiespace.com but the header dissapeared. can you help me restore the header? I love this template very much. however, I have a problem. The date of my posts didn't show on the top. Anyone has the similar problem as me? mengenai TOS blogger, kan navbar blogger sebaiknya ngga dihilangkan yaa..
nah, pas aku pasang template kaka, navbarnya gag muncul.. hiks..
aku pasang baby cute template kaka..
tp tiap mau dimunculin lagi navbar-nya, yang ada malah berubah font-nya.. hikss..
tolong dongg kaa.. dibuatin template baby cute yang ada navbar bloggernyaaa..
@nandini:setau saya TOS itu udah direvisi, cuma kalau kamu maunya begitu, nanti saya kirimkan..
makasii banyak ya mbak..aku tunggu ya mbka..
Love the baby blog. Can you tell me how I can change the font colors on my blog title. You can't seen the second line in my title because the font color blends in with the background. What can I do? I absolutely loove this template. Can I change it to a 3 column template, so that it's formatted like your blog?? I love this template, but I'm not sure how to add the nav bar. I can't see the New Post, Customize, Sign Out, etc. features that are typically built into blogger layouts. Can you help me add those navigation features? Thank you. Thanks so much...it's working perfectly!! I absolutely love this blog. Can't thank you enough. need your help. i downloaded the file, and i opened th page where i can edit my template. you say upload but there's no button like that. once i am in EDIT HTML, what i do is i right click on hte downloaded html file then i press edit. that way, the words appear from a notepad. those words (codes) i copy to the EDIT HTML page. once there i press 'SAVE TEMPLATE CHANGES' but it just doesn't turn out right. really need your help. thanks alot! I love this template, but the comments box is right-aligned where you can't click in and edit when using IE 7. I have noticed this with your demo as well. Any idea on how to fix this? Thanks for the great work...please keep going! Under "Blog Post", "Edit", even I checked the box "reactions" which allow visitors to vote, I still can't have this shown in my blog. Could you please let me know how to fix it? i have used ur blog and love it. its very pretty. i would like to check am i able to add links to the 'edit'?? thanks for ur fast respond but still dun get it. How can i edit such that it will link to the place that i want? and how can i delete it? sorry for asking so many qn, i am really not IT savy. 1 more qn, when i upload ur textfile, i click too fast and all my previous links and count is gone. is there a way to revert back? i would like to check y the date is not showing in my blog? @anonym: i didn't attached jpg file, only xml file, all background is linked URL..just upload it..
Quick question: Within the "Layout - Page Elements" edit page I am not able to move the gadget located on the right side (usually you can move these up and down). Any ideas what might be wrong? Also: I can't get the "Fonts and Colors" editing option to work. I really appreciate your getting back to me so quickly! Widget problem fixed (used IE instead of FF or Chrome). the page elements layout tells me this is how it is set up to display but when you view the blog (ourhippybaby.blogspot.com) it is not showing up that way. thanks! shouldn't the date automatically appear at the top of the post above the post title though? that's what's missing. i see that i can change the timestamp but would like to have both the date and the time there, but even when there is only one post per day there is no date heading above the post title right now. perfect! thank you so much for your help and quick response(s)!! "reactions" which allow visitors to vote, I don't have this shown in my blog even i have ticked the box. Could you please show me how to fix. beside , i would like to say your design is great ! all my sidebar were gathered at the centered after i upload this template. how could i switch them in one row to the right side? pls help. Hi again - I realized that people are having trouble leaving comments. It keeps saying it can't be processed and doesn't go through. Is there something I have to do to the code? ourhippybaby.blogspot.com is the link if that helps. thanks so much! i've gotten many complements on the blog so far! I really like this theme. How can I edit the links on the top menu bar? I see in Blogger, it says "edit", but I don't see how to do that. I'm a WP person usually, but don't know a lot about Blogger. Please, if you have time, send me an email to vdinigal at yahoo. Thanks! i have some songs, games, tips, for cute children.. Very Cute! is there a way to get rid of the flower image next to the post title? Please advise how to delete Edit Edit Edit at the menu bar (Home). And why i cannot drag Gadget up and down? Hi! thanks for the cute template! I have a small problem: I can't find how/where to edit the font-size of the date? I would like it to be a bit smaller. LOVE this cute template! My question: how do I change the EDIT EDIT EDIT to actually LINK to something instead of sending me to an error page? This is the cutest template I ever saw, I love it! However, I have the same question as Team Jensen, but I'd like to substitute the EDIT link to a link to anotehr site, how can I do that? I'm sorry for my ignorance, I'm a started at blogging, what are the links "POSTS RSS" and "COMMENTS RSS" for? Can I substitute them as well? Thank you in advance! how to add read more>> on my postings? I have activate the read more>> feature but it doesnt show up. mcm mana nak dapat picnya yang cute tue saja..yang ada gambar celana tue..bole tolong tak??? How do I make the font bigger in my posts? hi thanx for the tamplate.i have but a question when i go to layout and edit setting coulours it deosnt apear anything the case is empty iwant to change the size and the colour of wrinting..
@rifan: i dont define any variable so you have to edit it through EDIT HTML. how to change EDIT EDIT EDIT?? i cant change it to my needed links.. Using this beautiful template, but I don't have pagination links previous / next. How could I fix it ? Could you tell me how to make the navigation menu at the top a "drop down" menu? Romantic pink is a tender pretty girl can best embody the links of london color; the stars also began to become followers of and romanticpink, aroused a sweet and romantic agitation. See below nine groups pink star. Could you please help me. I was wondering if I could add a picket fence to your beautiful design? Please email me. Thanks! It's a nice baby template. How do you get rid of the EDITs at the top of my blog? ?